All the power of PropertyRadar – with you all the time, and in your pocket. Use PropertyRadar anywhere. Like the web application, the menu is in the upper left-hand corner of your device's screen after you log in. 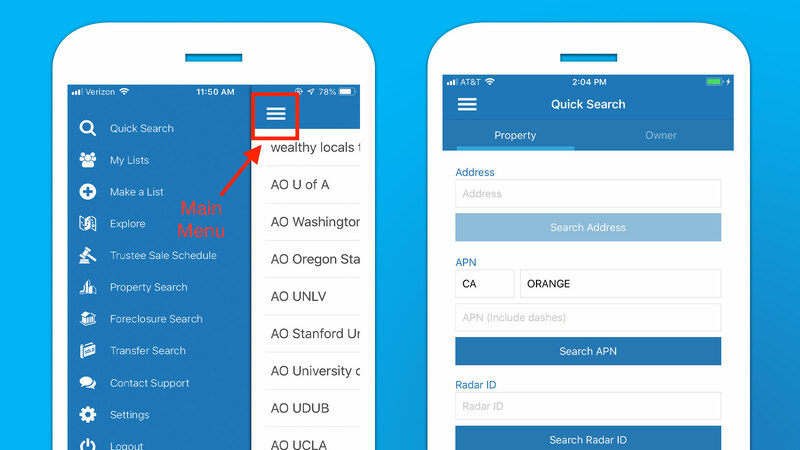 Tap the menu "hamburger icon" to find Quick Search, My Lists, Make a List, Explore, Trustee Sale Schedule, Property Search, Foreclosure Search and Transfer Search. If you have a specific Property or Property Owner in mind, use Quick Search to find them. Once you are in a Property Profile, at the top of your screen you will see a drop down menu next to "Overview." From here you can quickly navigate to any tab or section within a tab. 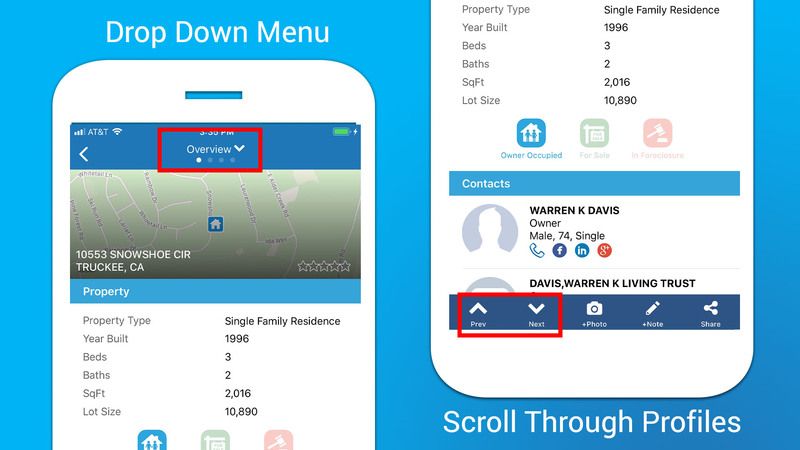 Or, simply swipe and scroll to see property overview, property details, contact details, and neighborhood details. At the bottom left of your screen you will find arrows labeled "Prev" and "Next." Use these to navigate through the different properties in your list. Find your future customers fast. Find answers to market questions. 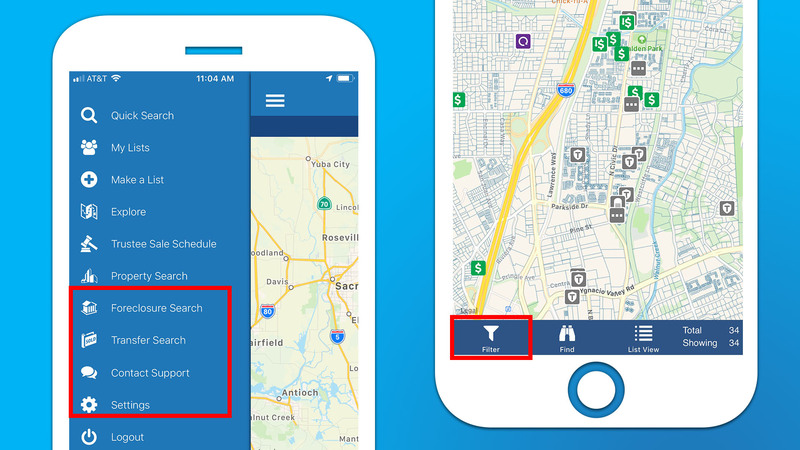 From Make a List in the main menu, tap the "add criteria" button under the map. Choose your own criteria or use any of the quick lists. Your criteria will show under the map in the window shade navigation box. To see all of your criteria, swipe up on the shade navigation bar. Tap the "x" next to any of the criteria to remove it or tap on the criteria to edit or change it. Polygon: One or more shapes outlining your search area. To add a polygon, start tapping on the map to trace around the area you wish to search, you need to tap at least three points to generate a polygon. To close the polygon, tap its first point. Tap the "Finish" button to confirm. You may have multiple polygons but they cannot overlap. Radius: To add a radius around a point tap and drag on the map to draw the circle with the desired radius. Once you have placed a circle, you can change the radius using the Shape Information textfields. Tap the "Finish" button to confirm. You may only have one radius in your search criteria. To start measuring distance, tap directly on the map the points you want to add. For each line you draw you'll get its measurement. To close the polyline and generate a polygon, tap the initial polyline vertex. Tap the layers button to turn on heatmaps and boundaries to visualize your market. From the main menu under "My Lists", you can find all of the lists you create. Scroll through your finished list or find "grid" at the bottom of your screen to display a card view of each property/property owner. Tap on a card to display the Property Profile and start getting insights. To navigate from map view, grid view and card view, simple tap the icon in the middle at the bottom of your screen. 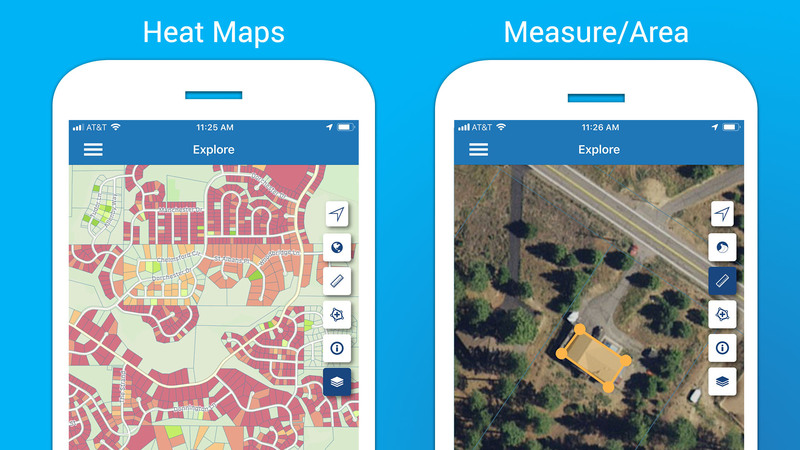 If you find a property of interest in either grid view or card view, tap it to learn more. Use the main menu to find Explore. Are you driving for dollars or door knocking? Turn on heatmaps by tapping the layers button to start finding new opportunities. Tap the "i" button to reveal the ledger for your selected heatmap. Tap a parcel to view the Property Profile for that property and add your own notes or photos. 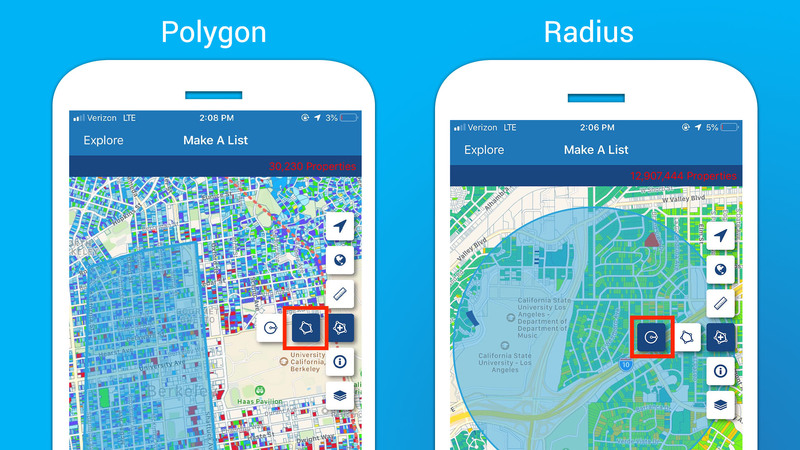 Trigger the Make a List interface from Explore by using the "Add Criteria" button or using a "Draw Criteria Tool" to create a polygon, radius, or rectangle. Each of these searches behave similarly in the mobile app. Find any of them from the main menu. Use the Filter button in the lower left-hand corner of your screen to see what's going on behind the scenes. Change any of the filters by tapping on them and then selecting your desired filter. Tap "Search" in the upper right-hand corner when you are happy with your search. From the Main Menu, tapping "Settings" will take you to your own mobile device's settings. From here you can change your location settings and notification settings. We recommend turning your location services and notifications on so you can always stay ahead of your competition and get alerts.